Castle Hostel i Ballycastle, Nord-Irland: Bestill nå! Free cancellation for group booking cancelled 8 or more days in advance of check-in day. 50% of full fee payable for cancellation by email to castle.hostel@btinternet.com up to 2pm on day prior to date of check-in. Castle Hostel reserves the right to demand a security deposit by cheque or cash for any sum up to full payment and to withhold confirmation of the reservation until such payment has been made. 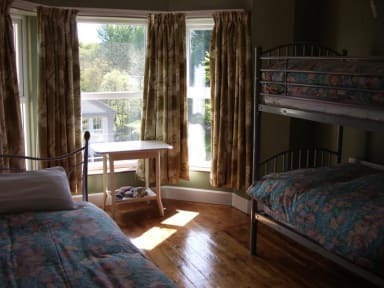 Castle Hostel offers boutique hostel accommodation for the budget traveller to the North Coast. 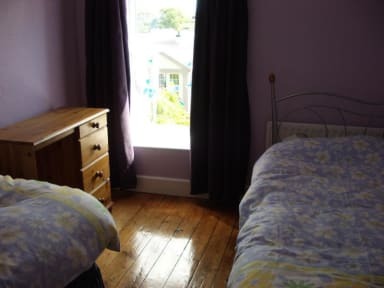 Located on the second and third floor of the end house of a Victorian terrace, Castle Hostel offers six bedrooms with two or three bed spaces in each. One of the bedrooms is en suite while the rest use two shared bathroom facilities. Sheets are provided for beds but any guest who requires a towel must pay a 1/1 surcharge. The hostel also has a kitchen and a bright roomy kitchen/living room area where free Wi-Fi is available.